Parents will be able to look after their newborn at home for the first year under plans to extend parental benefit. The Government has promised to give mothers and fathers seven weeks of paid leave each by 2021. When combined with existing maternity and paternity entitlements and normal annual leave, it means couples will have enough time off for one of them to be at home at all times for the year. In last month's Budget, it was announced paid parental leave will be rolled out from late 2019 with both parents entitled to two weeks off. It has now been confirmed that this will be extended to seven weeks each by 2021. The State will pay an allowance of €245 per week. At least 65,000 individual parents are expected to benefit from the scheme in a year. Children's Minister Katherine Zappone said the move was just one step in a "ground-breaking" strategy called 'First 5'. It aims to give parents a wider range of care options for their children up to the age of five. A dedicated child health workforce is also be to hired, while a 'baby box' with clothes and books will be supplied to new parents in hospital. Currently, mothers are able to take 26 weeks of paid maternity leave and up to 16 weeks unpaid. Fathers get just two weeks of paid leave. A Fianna Fáil bill, which would have allowed mothers to share their maternity leave with their partners, was roundly rejected by the Government just last week. Social Protection Minister Regina Doherty, whose department will oversee the implementation of the new parental benefit scheme, said the Government is particularly conscious that fathers need more time with their children. "The evidence shows that when fathers take a more significant and meaningful share in the parenting of their children, the individual family benefits, and so does wider society," she said. Having more parents stay at home for longer will also help the Government alleviate the looming crisis in childcare. 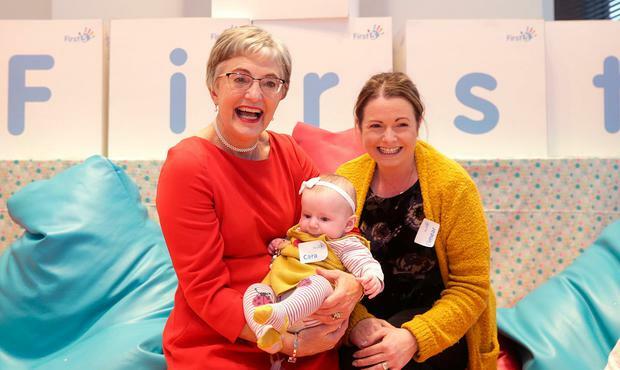 As part of the 'First 5' programme, Ms Zappone has also committed to setting up a group of experts to develop a new public funding model for childcare and early years learning. She said it will ensure that when the State increases subsidises to families, they will be assured that childcare operators will only be able to enact modest price hikes. The minister also said that childcare workers will be "paid according to their qualifications". In the area of healthcare, Health Minister Simon Harris has committed to resourcing the implementation, expansion and enhancement of the National Healthy Childhood Programme through the development of a dedicated child health workforce. Public health nurses play a crucial role in this work. The Children's Rights Alliance welcomed the strategy as a move "in the right direction", but said it was "not enough to ensure that children get the best start possible by being with their parents round the clock at this age". Tanya Ward, chief executive of the Alliance, described the overall plan as "ambitious" but said the Government would have to prove it was capable of delivering all the key objectives.